Are you searching for the top suburbs in Nashville, TN? We’ve put together a list of the most popular Metro Nashville communities. The more affordable suburbs are usually further outside the city, but if a short commute is your main priority, then you may want to check out other great areas around Nashville like East Nashville, Bellevue and Crieve Hall. Antioch is a suburb located about 15 minutes from Nashville. This is one of the more affordable areas in the city, which is perfect for many first-time home buyers. As home prices in the metro area rise, we expect Antioch will continue to see more interest from buyers. Located about 25 miles south of Nashville is the suburb of Arrington. You can expect to find beautiful scenery with rolling hills and larger homes here with acreage. The popular Arrington Vineyards is also located here and is a perfect weekend outing. The community of Belle Meade might be one of the more prestigious areas in Nashville. Many of the homes here are large historic estates with prices easily topping $1 million. Residents here enjoy a quick commute to downtown as well as venues like Belle Meade Plantation and Percy Warner Park. This area, like many across Nashville, has seen dramatic growth in recent years. It remains popular with homebuyers because of it’s relatively short commute and the fact that it is still an affordable suburb. With a $200 million redevelopment of the Bellevue Center Mall, this area is primed for more growth. If you want to be in one of the top school districts in the state, then you may want to consider Brentwood, TN. This established city is about 15 minutes south of Nashville and is one of the pricer parts of town. It’s residents enjoy a quiet and safe community and is known for luxury communities like Governor’s Club. There are plenty of restaurants,shops here and of course top notch Williamson County schools. This suburb, which is just north of Nashville, has been quiet and isolated for most of it’s existence, but it is starting to receive a lot of attention as one of the next areas to invest in. Just across the Cumberland River, the home prices here are still very affordable, but that is expected to change in the near future as it garners more interest. One of the Nashville communities that has seen the greatest rise in popularity and home values in the last 5 years is Crieve Hall. This area has an excellent sense of community and offers reasonably priced ranch-style homes. It’s also just 15 minutes from downtown Nashville, which is perfect if you have to commute. If you’ve ever flown to Nashville, then you’ve been to Donelson. Besides the airpot being located here, this area is also one of the fastest growing desirable suburbs. Homes here are still very affordable and you’re just 15 minutes east of downtown. You’re also just a few miles aways from Percy Priest Lake. Known for some of the best restaurants in the city, East Nashville has also become one of the hottest places to buy a home in the metro area. You’ll find beautifully restored historic homes here with home prices typically raging from $300K – $600K. Downtown Nashville is also just across the Cumberland River. Located about 30 miles southwest of Nashville is the suburb of Fairview. Fairview is called the “Next Frontier” of Williamson County because there is so much undeveloped rural land. If we had to bet, this is one community to keep an eye on for massive residential growth in the near future. Just a short drive from downtown is the beautiful and quiet community of Forest Hills. Here you’ll find many luxury homes nestled on steep hillsides and you’re just a few minutes from excellent shopping and restaurants in Green Hills. Voted as the “Greatest Southern Town“, Franklin has something to offer for everyone. The large town square offers a variety of shops, restaurants, pubs and even a historic movie theatre. Many stars like Tim McGraw & Faith Hill also live in this family-friendly suburb. Home prices have steadily crept up in Franklin, but their are still affordable options available like Fieldstone Farms. Goodlettsville is a fast growing suburb of Nashville located about 15 miles north of Nashville. This area offers affordable housing options and a bearable 30-45 minute commute to downtown. If you’re looking for a low-cost lifestyle and easy access to everything the city has to offer, then this could be a great option for you. Green Hills is a busy suburb about 5 miles outside of Nashville. There are plenty of local shops and restaurants located in this community, including the Mall at Green Hills, which stays packed year round. The famous Blue Bird Cafe is also located here. While the homes here are absolutely beautiful, keep in mind that you will pay a higher price tag for the convenient location. The city of Hendersonville is a very popular community because of it’s affordability and excellent schools. Located about 30 minutes to the east of Nashville, it is becoming a solid option for homebuyers that don’t mind a little commute. Many of the homes here also have amazing waterfront views of the Cumberland River. Named after the home of President Andrew Jackson, Hermitage is situated about 15 to the east of Nashville. Homes here still remain affordable compared to the rest of the city and the location offers a fairly easy commute. Also located here is the Deloitte headquarters, one of the four biggest auditors in the world. This little suburb of Nashville has become one of the more popular areas in the city. With home prices skyrocketing in East Nashville, more and more people are looking at this neighborhood as an alternative. Residents here can be in popular 5 Points in a matter of minutes and the downtown commute is a breeze. Only about 8 miles north of downtown Nashville, the community of Madison is a perfect area for anyone looking for an easy commute and lower home prices. Homes here are typically smaller, older properties, but with the influx of new residents there has been a boom of larger new construction homes. We see many first-time homebuyers target this area because of it’s affordability. You could say that all roads lead through Mount Juliet as I-40, I-65 I-24 and SR-840 all border the suburb. This prime location makes the suburb very desirable and is one reason why it was ranked as one of Tennessee’s fastest growing communities. Mt Juliet High School is also one of the top ranked schools in the metro. This large city of over 120,000 people is considered part of metro Nashville. While many people do commute to downtown from here, be aware that the average drive time is 45 min to an hour. However, if this is not a problem for you, you can find homes in Murfreesboro for much less than other areas closer to town. The community also has a wonderful square and is home to Middle Tennessee State University. Located in popular Williamson County about 45 minutes south of downtown, Nolensville is a suburb of Nashville that is seeing tremendous growth. While Brentwood and Franklin have become out-priced for some, this area still provides an option to live in Williamson County at a lower cost and take advantage of excellent schools. Oak hill is a luxury suburb located about 15 minutes from downtown Nashville. Homes here can easily reach $1 million and the community maintains their own municipal government. Also located here is the beautiful Radnor Lake State Park, which is over 13200 acres and features 6 walking trails and amazing scenery. Named after President Andrew Jackson’s nickname, Old Hickory is located on the Cumberland River and about 30 minutes from downtown Nashville. Many of the residents that live in the community work at the large Dupont plant which is based here. Also, homes here tend to be very affordable for the most part, but can reach over $1 million in some areas. Located in Rutherford County, this suburb of Nashville is about 45 minutes southeast of downtown. Smyrna might be best known for the massive Nissan plant that employs over 6,000 people, of which many call this quiet community home. Overall, home prices here are reasonable and most homebuyers should be able to find something no matter the price range. 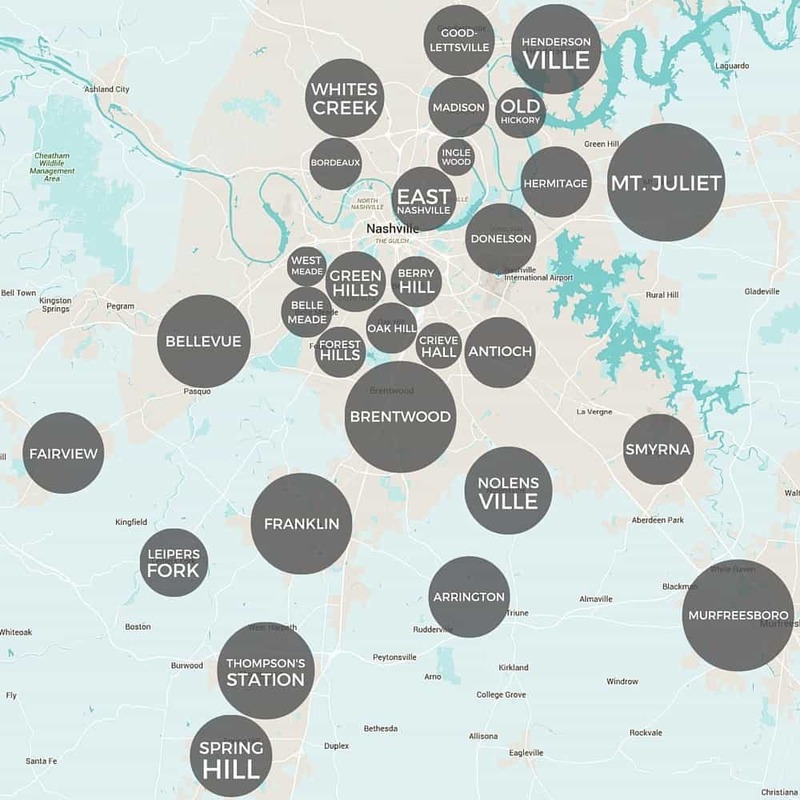 One of the areas around Nashville that has seen the most explosive growth in the last few years is the suburb of Spring Hill. Williamson County schools are very desirable for homeowners, but areas like Brentwood and Franklin are out of many peoples budget. Spring Hill provides another affordable option to live in Williamson County, which is why it has seen such a dramatic boom in it’s real estate market. While the commute is not ideal if you work downtown, we see this being a hot area for quite some time and a great suburb for retirees as Del Webb recently announced it’s newest community, Southern Springs. Like Spring Hill, Thompson’s Station real estate is slightly more affordable than the more established areas of Williamson County, but homeowners here still benefit from the excellent schools. Not to mention, the location is ideal with direct access to I-65 an SR-840. If you’re commuting to downtown Nashville, you should expect 45 min – 1 hour each way. This has become a very desirable area in Nashville. The typical home here is a mid-century ranch with good size, mature wooded lots. It’s excellent location and convenience are major reasons that West Meade has become so popular, which is why potential homebuyers will pay a premium for property here. Whites Creek is a rural community located about 10 miles north of downtown Nashville. This area has just begun to see a slight increase in builder development and home prices are still very affordable. As Nashville continues to expand, we expect to see more growth in this area. Kaitlyn, Joy and the rest of the team at the Layson Group were amazing to work with. We were moving from out of state and they made the process extremely easy. Kaitlyn recommended many local companies that were also wonderful and made the transition so smooth. 100% highly recommend!